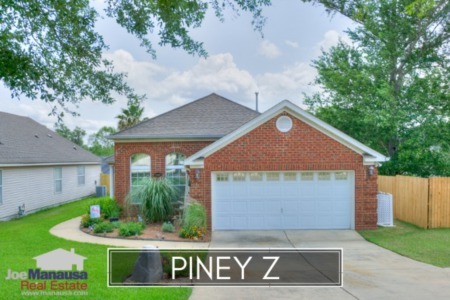 One popular NE Tallahassee neighborhood that is in for a wild ride over the next ten years is Piney Z. First of all, there are a lot of attractive amenities that will draw people to this small community located off of Conner Blvd. ; including newer homes, a lake, Tom Brown Park and Lincoln High School. The access to pools, lakes, parks, and the lodge provides lifestyle benefits that cannot be found in every Tallahassee neighborhood, so projecting continued demand for this area is easy to do. But the graphs included in our report below also show great potential for pent-up supply that very well could overwhelm demand and put a strain on home values. If you look at all the purchases from 2002 through 2005 (when all the homes were new) and contrast it to all the home sales since, you can see the majority of residents in Piney Z are approaching their move cycles at the same time. If the worst-case scenario were to happen, the competition among home sellers for buyers will be brutal. 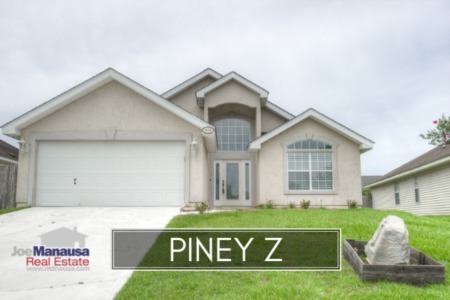 In this report, we examine long-term trends for home prices, home values, and home sizes in Piney Z, as well as show all current listings in the Tallahassee MLS and all closed home sales in Piney Z going back to 2002 when the first homes there were sold. It is important to note that the narrative contained below is for sales through December for all previous years, but through the 25th of June in 2015. The graphs and the closed sales table will be continuously updated into the future (meaning bookmark this page if you always want to know the current status of homes in Piney Z). Average home prices have fallen less than 1% in 2015 versus 2014 (which was 4% lower than 2013). It is apparent that buyers know how much they are willing to spend right now in Piney Z, but these falling prices are NOT a sign that values are falling. Currently, average home prices are 25% below the peak of the market prices established in 2006. Distressed home sales are still happening at a rate consistent with other neighborhoods in Tallahassee, impacting average prices negatively. The average recorded sales price is $201,100 for Piney Z thus far in 2015. Home sales activity this year is consistent with units sales in 2013 and 2014. Thus far in 2015, there have been only 26 closed home sales in Piney Z (versus 48 for all of 2014). Average home values in Piney Z have were flat last year, after having recovered nicely in 2013 from the low set back in 2012. Through late June, the average value of a home sold in Piney Z has been $115 per square foot. This is up 10% over the bottom reached in 2012, but still down about 21% from the market high set back in 2006. This means that the majority of homeowners who have purchased or refinanced in the past 10 years are likely at zero or negative equity situations. The average home size sold in Piney Z typically falls in a range of 1,700 to 1,900 square feet, and buyers this year have selected homes nearer the bottom of this range. The 26 sales thus far in 2015 have averaged 1,739 square feet, but don't be surprised to see this rise somewhat as the year progresses. The following list of homes are all of the Tallahassee MLS listings in Piney Z. The following list shows all home sales going back to when it all started in 2002 in Piney Z. Note that you can change the sort order by clicking the column heading for the data you wish to sort by. I hope you enjoyed our June 2015 update on home sales in Piney Z, please feel free to drop me a note if you have questions not covered in this report.